Small to Medium sized businesses worldwide can benefit from our online custom business software offerings. We have created a complete working environment which integrates third party email, files, messaging, bookmarks, passwords, contacts, video conferencing, office documents, image editing and custom business software into one web based application. 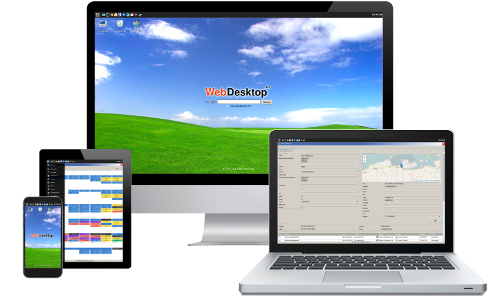 WebDesktop allows you to control your business and expenditure with no license fees. As a Free Software (Open Source) solution, the cost of initial design, installation and configuration are the only capital costs. If you opt for online hosting for your softare suite, then this is applicable as are optional support agreements. However, because your company owns the software, you can have unlimited users and make any changes you wish with a third party developer, or with our developers at contract rates. At Lloyd Hardy Enterprises, we believe that all software should be ethical software and that license fees have no place in business software. We offer free initial consultation and project proposal along with fee based consulting for your project if required. For more information on our WebDesktop offering or to arrange a meeting or online demonstration, please contact us.